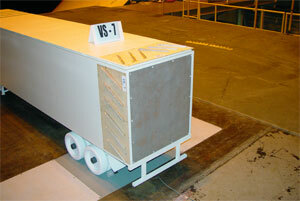 Strakes on the top and sides of the trailer generate vortices, which entrain momentum into the trailer's wake region. The resulting upwash and inwash flows increase the pressure on the base of the trailer and reduce drag. This technology has undergone extensive road testing. Fuel savings of between 2 to 3 percent were demonstrated in the wind tunnel and road tests of this technology. For an in-depth analysis of the road tests of this technology download the SAE technical paper (628kb pdf).